How divided is Egypt's Muslim Brotherhood? A Facebook call calling upon the Muslim Brotherhood youth to overthrow their leadership has stirred debate as to whether Egypt’s largest Islamist group is facing an internal crisis. Also Egypt’s largest opposition group, members officially deny that internal divisions are rife. Within a few days of the overthrow of Mubarak, a Facebook event entitled “Muslim Brotherhood Youth Revolution” was established, calling on the Muslim Brotherhood Youth to overthrow the upper echelons of the group. The event was supposed to be a demonstration planned to take place in front of the Brotherhood's Guidance Bureau on 17 March. The group stated that their rebellion was related to the Brotherhood leadership’s position during Egypt’s 25 January Revolution, arguing that the leadership was not in touch with the “25 January revolutionary spirit”. The demonstration did not take place. Nevertheless, there were some signs of a gap between the youth and the leadership within the Islamist organisation, starting the 25 January popular revolution. When the revolution was first called for by the "We are all Khaled Said" Facebook group (a page setup to commemorate the police killing of a 28-year-old youth), the official Brotherhood position was not to join. However, responding to a call targeting all youth to rise against police violence on Police Day, many of the organisation’s young members participated. Their presence was made apparent by the hundreds arrested from the Brotherhood during the 25 January demonstrations. Although none of the leaders were arrested, as they did not join, many of the unknown young members were behind bars. Mentash was one of those arrested on 25 January, although he denies that his participation was a defiance of the organisation’s decision. He says that in his cell there were a minimum of 20 other members and that most of those who joined the protests were instructed to do so. “The official statement of Essam El-Erian was that the Muslim Brotherhood was not officially participating but that the youth should express their anger. This is considered an instruction to participate and in fact during the 25 January dawn prayers in the mosque close to where I live, we were instructed to go to Mostafa Mahmoud sq while others were instructed to go to Imbaba,” says Mentash. Tahrir Square events, on the other hand, still revealed differences within the group. As the Brotherhood played an important role protecting the sit-in occupying Tahrir Square while Mubarak’s police and thugs were trying to attack, the young members of the organisation were often seen to disagree with their leaders. For example, when the military instructed demonstrators to remove barricades placed by protestors to around the square, though this decision met with agreement from a leading Brotherhood member and former MP Mohamed El-Beltagy, it was rejected by the Brotherhood youth. Strongly involved in the deadly battle of Tahrir Square, which left tens of demonstrators dead, the young Brotherhood members fought with El-Beltagy when he tried to persuade them to accept the military’s instructions. He was interrupted and forced to come down off the stage centering the square. Osman, unlike other Brotherhood members, is in dialogue with other opposition groups. Being part of the Revolution Youth Coalition, which helped trigger the revolution and provide it with field leadership, Osman is often in negotiation with the leadership so as to find a middle ground between the Brotherhood on one hand and the other revolutionary groups on the other. During the referendum on constitutional amendments proposed following Mubarak’s ouster, the opposition was split between a “Yes” vote and “No”, with the Muslim Brotherhood saying Yes while most of the other opposition groups said No. Osman explained that some of the young Brotherhood members involved in broader coalitions, such as him, were trying to avoid any split and reach a compromise. “We tried to convince the leadership to maintain their position for a 'Yes' vote but with conditions. We persuaded them to keep from announcing their final position before we negotiate such a position with other groups like the National Association for Change (NAC). However, what happened was that before we got a chance to propose this vision, the NAC had already pronounced their position for a 'No' vote, although we had set a date with them to negotiate, leaving us unable to persuade our leadership to work for a compromise,” says Osman. The Muslim Brotherhood was sharply ciritcized by other opposition groups for their decision to campaign for a “Yes” vote, leaving the young Brotherhood members alienated from broader political circles. Nevertheless, Osman underlined that “these differences cannot be considered a rebellion from the youth’s side but simply a disagreement,” refuting that a “Muslim Brotherhood Youth Revolution” — as proposed by the Facebook group — is real. Still, the conference organised by the Brotherhood’s youth on 26 March was conspicuous in that it lacked any presence of Brotherhood leaders or senior figures. Although the youth say that this was not intended, explaining that the timing was simply not suitable for most senior members, the argument left many unconvinced. The alleged resignation of Muslim Brotherhood member Abdel-Monem Abuelfotouh days after the youth conference left more people convinced that the Brotherhood was actually divided. 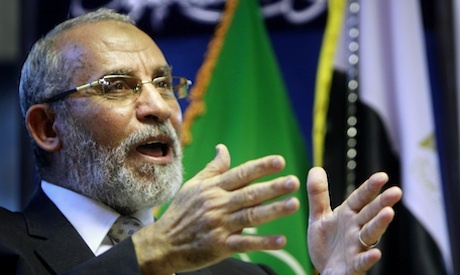 Several newspapers claimed that Abuelfotouh had resigned from the Brotherhood, an expected move after several disputes were made public between him and the organisation. He has since denied that he had resigned. Abuelfotouh had declared his intention to form a political party with the name “Al-Nahda” despite the Brotherhood’s formal decision prohibiting its members from joining any party other than the “Freedom and Justice Party" it is forming. The Brotherhood leadership had also declared it will not put up a presidential candidate, but a couple of days later Abuelfotouh announced he might run for president. Gamal Nassar, official Brotherhood spokesperson, told Ahram Online that he could not confirm this information since he was away on vacation. On the evening of 29 March, Abuelfotouh denied the rumours on his website. Abuelfotouh’s story, however, reveals that divisions within the Muslim Brotherhood are not only between young and senior members, though nothing can be confirmed, but may extend across the group as a whole. I give a lot of credit to the Muslim Brotherhood for being prepared and good survivals, but please they should focus on religion and stay faaaaaaaaaaar away from politics and state issues please!!! I respect the Muslim brotherhood for their organization. However, I fear that organization is based on strict obedience to the orders of the elder members. If true this means they are preaching democracy but practicing patriarchy, which is the same model as the old regime.